Please remember to notify the Box Office at the time of booking that you require seats with a good view of the captioning screen. Editorial assistant Dean stumbles into work, hungover from last night’s mortifying party at Gloria’s house. Surrounded by his ambitious co-workers in their Manhattan magazine office, the only thing that matters is how fast you can climb the journalistic ladder of success and get your name in print. Today is just another ordinary day, until suddenly it’s not and the stakes for who gets the story become higher than ever. Branden Jacobs-Jenkins’ explosive Pulitzer Prize finalist Gloria is a fresh and surprising new satire that takes a scathing look at office politics, our exploitative, media-saturated age and holds up a cracked mirror to American culture. 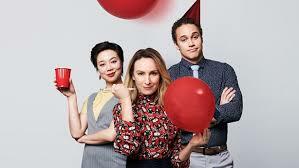 This Australian premiere is directed by Lee Lewis (Hay Fever) featuring a favourite of stage and screen, Lisa McCune (Cabaret) like you’ve never seen her before, with Callan Colley (Three Sisters), Jordan Fraser-Trumble(The Legend of Ben Hall), Jane Harber (The Speechmaker), Aileen Huynh (Cleverman) and Peter Paltos (Minni & Liraz).